In the United States, hearing loss is the third most common medical condition, after heart disease and diabetes. Hearing loss affects 48 million Americans – approximately 20% of the population – with many cases occurring in adults age 65 and older. At the same time, research has found that younger populations are also at risk for hearing loss. With the ubiquity of personal electronic devices that provide longer battery life and also the convenience of earbuds, people are exposed to louder sounds more often, on a more regular basis. For the past decade, researchers have found that decibel levels have been rising in our modern world, from restaurants to public transportation to our jobs. The National Institute on Occupational Safety and Health (NIOSH) estimates that some 30 million Americans are exposed to dangerous levels of sound in the workplace. As a result, the World Health Organization has estimated that rates of hearing loss are rising. And this affects anyone, at any age. But how do we figure out if our hearing abilities are changing, especially when hearing loss is an invisible condition? The best way is to take an annual hearing test. Hearing loss occurs gradually, over an extended period of time. We may not recognize right away that our experiences are due to hearing loss. At first it may sound like people are mumbling or that it’s just background noise that’s making conversations more difficult in loud environments. It is estimated that people wait an average of seven years from the time they first experience changes in their hearing before they decide to take a hearing test. Hearing specialists recommend that people take a hearing test as soon as they begin to suspect changes in their hearing. Early detection and the treatment of hearing loss benefits overall health. Over time, leaving hearing loss untreated will lead to many negative effects on one’s overall health and well-being. While at first it may appear that people are mumbling or difficult to understand, over time untreated hearing loss may lead people to withdraw from social settings, from their friends and loved ones. Untreated hearing loss has also been linked to potential increase in risk for dementia, due to the cognitive load that burdens the brain when it attempts to sort out sounds. Studies have found that people with untreated hearing loss have less earning power than their colleagues with normal hearing, and that there is an increase in accidents and hospitalizations. The best course of action – to prevent the onset of these consequences – is to make sure that your hearing abilities are at their best. By scheduling an annual test, we’ll be able to keep a close eye on your abilities and notice if there are any changes. Schedule an Annual Hearing Test with Us! One in three Americans age 65 or older experience hearing loss, while 50% of people age 75 or older experience hearing loss. Hearing specialists recommend that people age 50 and over begin to schedule annual hearing tests to ensure that their hearing abilities are functioning properly. 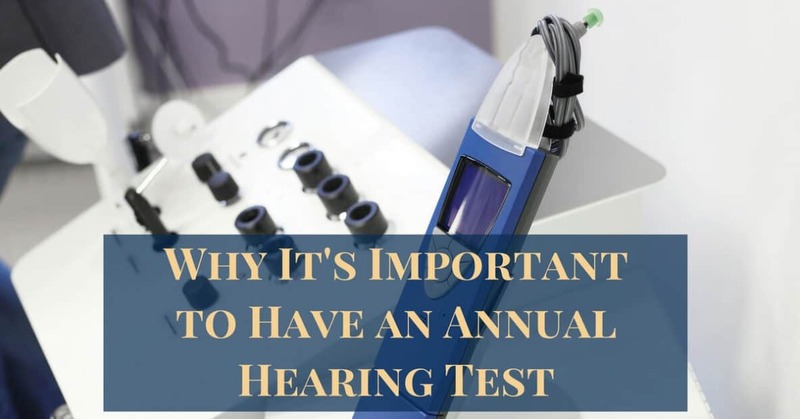 In the same way that we all have annual physicals, or for those of us who wear glasses, an annual eye exam, it’s time to make hearing tests an annual part for your health regimen. Hearing, though invisible, is a crucial part of our health and well-being. By our sense of hearing, we connect to our family, friends, and loved ones, and to the world around us. An annual hearing test is simple and painless. We will also be able to provide information on your hearing abilities immediately. If a hearing loss is present, we will recommend the best course of treatment. To learn more about what happens during a hearing test, visit us here. Notice changes in your hearing abilities? Schedule a hearing test with us at HeaRite today! You don't have to live with untreated hearing loss. Reach out to us to schedule your annual hearing screen today.